At a time when consumer awareness of environmental toxicants in general – and of tainted household products especially – is on the rise; potential for recalls are commonplace; and manufactures and distributors are moving to tighten up supply chain oversight, Pottery Barn CONTINUES to disappoint. Despite specific recalls for Pottery Barn products in the past [Link], they continue to manufacture and sell products with Lead. To be clear, outside of regulatory standards for items intended for use by children (which need to test below 90 ppm Lead in the paint or coating and below 100 ppm Lead in the substrate) there are really no regulations in the United States restricting the total content of Lead, Cadmium, Arsenic or Mercury in consumer goods. However – in my opinion – the lack of regulation does not give any company a “free pass” to continue to produce toxic products (especially once they have already had their hand slapped for actually creating a product intended for use by children that was recalled for Lead.) Once one (or more) of a company’s products have been recalled for Lead – consumers would expect them to be more vigilant in the future. While Pottery Barn dishes seem to be getting better (lower levels of Lead in general in some designs – including (sometimes – but not always) reduced levels of Lead in the logos and brand markings on the backside of their ceramic dishware products), I am never surprised to find a Leaded product from Pottery Barn — because they just keep popping up with far greater frequency than most retailers. In fact, when I do a home visit with families I expressly look for Pottery Barn products that may (unexpectedly to the consumer) have unsafe levels of Lead. 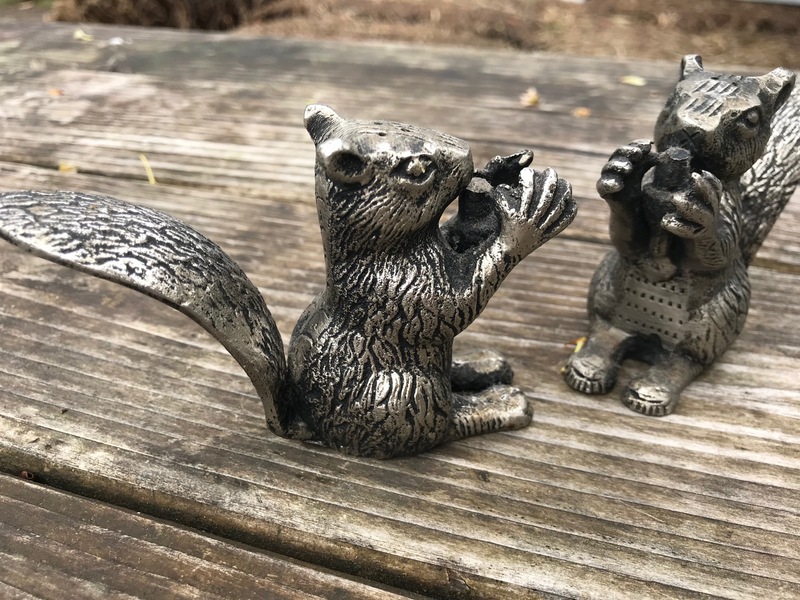 The Pottery Barn squirrel salt and pepper shakers pictured here are made of Leaded pewter. This is a super-rare find in the general marketplace these days, because MOST responsible companies KNOW BETTER, and have been producing/sourcing similar decorative large, solid-metal items out of modern, Lead–free (or at the very least, trace-level Lead content) alloys for awhile now. These salt and pepper shakers are also a rare find because most responsible companies KNOW at least not to use Lead in a functional food-use product – especially one that is used in the process of dining, where bare hands (hands that are in the process of eating a meal) might handle the item and then touch food before it goes in the mouth. Examples relevant specifically to the use of salt and pepper shakers — just off the top of my head: chicken wings? corn on the cob? celery sticks? popcorn? French fries or other kids’ favorite “finger foods” that might require salt! As soon as I have the opportunity, I will test these squirrels with a swab (I have them in storage as they were donated to my “Museum of Lead” collection), and will update this post with any additional insight that may provide in terms of this particular aspect in this case. However, to be clear, in my experience with other homogenous solid metal items with a similar amount of Lead… the Lead usually will transfer onto (quite measurably contaminating) the hands of the user of the item. Hey Pottery Barn!… in 2019 (or 2017 or 2016 or whenever in the last few years these were made) there is NO defensible reason to have ANY product in your store with Lead levels this high. To see more Pottery Barn items I have tested, click here. Metals not detected are not listed above. Tests were done for at least 60 seconds to confirm the readings. Results are accurate and replicable using a Niton XL3T XRF instrument – freshly calibrated, testing in “Consumer Goods” mode. As always, thank you for reading and for sharing my posts.